Remember last week I was telling you the story of how my beau and I almost missed the crazy beautiful lunar eclipse? I made a video about it because it has such an impact on me. I mean, heck, I’m a coach. I talk about following through on intention all the time. And yet, that ole Squawky Polly mind almost had me choose the comfy couch over a rare (and romantic) lunar happening! How is it possible to be so easily lured into listening to a voice in my head that tells me what I should do or not do? Especially when I know that voice is always wanting me to lie low and live listlessly? I’ve been thinking about this so much lately. 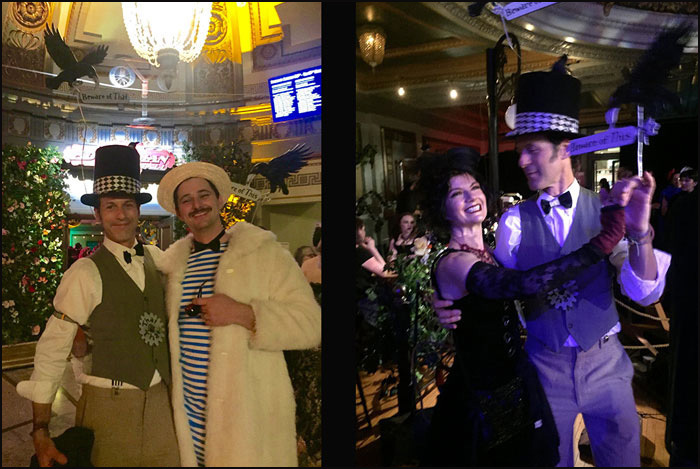 Here’s something related, something I also nearly missed: The Edwardian Ball. Every year in San Francisco (and Los Angeles, too!) there is an enchanting steampunk event filled with music, performances, fashion, and a whole lotta beauty. There were those voices. There was that same process of dragging us down. Thank goodness we didn’t listen. Instead, we focused on how connecting it is for us to go and how it always makes us so happy. And so … we went. we had a blast, it was an amazing night! I’ve been thinking about how important it is for people to be surrounded by beauty, color, music, and laughter. It would be easy to think of something like this ball as frivolous when there are so many serious and important happenings in the world. When there is so much hardship. When there is so much violence, anger, and divisiveness. But an event like this feeds people’s spirits. I think it brings us back to our basic human joy of being together in celebration. Being called to be creative and being given the space for self -expression are so important. Lightness + joy can bring out the best in us. I know it is a luxury. And I am so grateful. This makes me think about when I visited Mali, West Africa, in the 1990’s. I was enchanted with the colorful clothing and with the drumming/music. People gathered outside frequently to be together and sing/dance/play music. There is such a depth of connection that comes from that shared joy. Music and color and expression are woven into the culture. It seemed to me that families didn’t need a reason to dance, sing, or wear colorful clothing. They just created it. In the mud huts or in the dusty streets. An abundance of joy and community. I don’t know what it looks like for you. It might not be African drumming or a steampunk ball. Maybe it is listening to classical music while watching the lunar eclipse. Maybe it is baking cookies with your children and decorating them in crazy colors then dancing around the kitchen together. Maybe it is wearing your best dress + lighting some candles when you make pizza at home with your spouse tomorrow evening. Maybe it is making art and hiding it for people to find in a public place. Maybe it is going to see dance or an art exhibit that calls to you. Maybe it is knitting colorful gloves for the homeless. Maybe it is making art yourself, even with finger paints. Maybe it is simply singing out loud as you walk home from the bus stop. What kind of music or self-expression or color do you long to have more of in your life? Do you have the support you need to keep moving toward it? 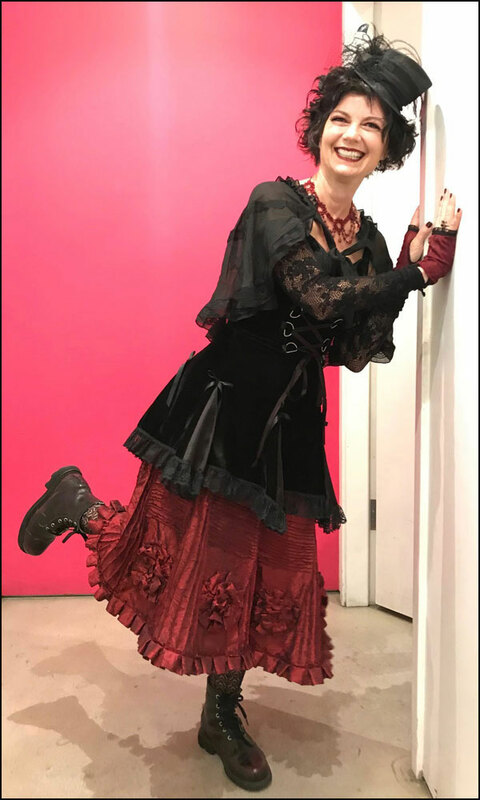 I know part of the reason this Edwardian Ball is so much fun is because everyone who attends REALLY SHOWS UP. People take the time to create amazing costumes and to bring an openness to be enchanted. They show up ready to connect + laugh. I’ve attended a camp for adults that is called Life is a Verb Camp, created by Patti Digh. It is completely different, but also the same. People show up for that event ready to experience magic and connection. There is an intention set way before the camp ever starts. People crave creativity + authentic connection and so they become it. They bring it. I think we need more of this in our daily lives. This intention to find magic. We can be better at helping one another seek and create beauty and joy. And why not? Life is fleeting. It goes by so fast! We can create excuses to dance and laugh together. We can make up holidays. We can celebrate way more than we allow ourselves to. I really think one of my main purposes here on earth, but more specifically, as a high performance coach, is to help people open up more and more to what lights them up. What feels like a celebration of your own unique spirit? From that lit-up place of celebration in ourselves and our own lives, we easily access a well of generosity to give to others. As I’m writing that, I’m thinking how much fun it would be to do a very small group coaching program that kickstarts that place of being lit up. How great it would be to journey together and explore who we want to be in the world and how we find the energy/time to make that happen. Email me at Sherry @Simplycelebrate.net and let me know if you’d like to be a part of a short, three or four- week kickstart joy group.